The sibling relationship is one of the most complex I can imagine. Either a tie or a very close second to the complexity of child/parent relationship. While friendships and spouse relations can certainly be complicated, at least you’ve signed up for them. And, if the very worst happens, you can terminate them. Not so with siblings! Sure, you can terminate interaction if you choose, but you’re still siblings. Ever discover your sibling’s recollection or interpretation of a given event so differs from yours it makes you wonder if you’re talking about the same thing? I find it fascinating that people raised by the same parents in the same environment have such different takes on the whole experience. And, of course, it’s all colored by the relationship each had with the parents and how the environment affected each. Complicated, or what? So love-hate, so yin-yang. I have heard about families where the siblings grow up as inseparable best friends. While it sounds lovely, that is not the family I was raised in. But I have found over the years, that the same two and three year gaps that made me an outcast in my teen-aged sister’s and brother’s world are pretty negligible now. And the four year age difference between me and my “little brother” are irrelevant in this phase of life. One frustration in the mix is having so much information about each other that sometimes we don’t recognize, or have recognized, the personal growth that each has undergone. 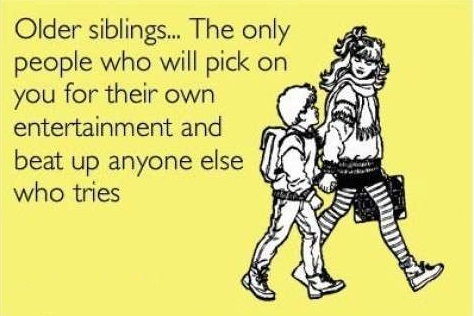 Maybe because my three siblings and I have all lived in different states for decades, this is heightened in our case. Or maybe because no matter how evolved, mature, and confident we all get, there is some regression when interacting with siblings. I realize that on the other side of the best-friend-sibling’s rosy spectrum, there are the caustic sibling relationships that can be irreparable. Or the unrealized relationships that did not get to evolve because of illness, death, or some other form of loss. Whatever the relation, it contributes to our own growth, how we view the world, and the decisions we make. Did I mention this was complicated? I mean libraries of books have been written on this stuff! What I do know is that no one else in the whole world knows my origins and what my young life was like more than these siblings. Even though sometimes it is years between visits with each other, we just talk. Conversations never start out with “My father was the type of man . . . ” or “when I was growing up . . . ” because we know. We all understand that each experienced some harsh disciplines, heightened expectations in our childhood that eventually served us well, the fruition of parental wisdom, and an appreciation for how and where we grew up that isn’t possible in the youthful moment. This adult-sibling bond cemented by shared history is what I celebrate. And now, I have recently learned, that there is actually a day of the year to commemorate such bonds. 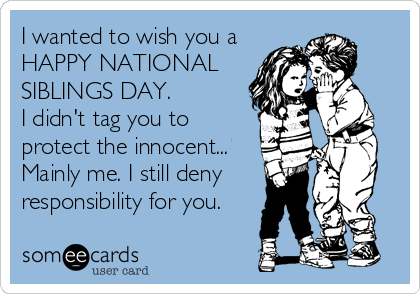 While Mother’s Day and Father’s Day have been federalized and on the calendars for decades, National Sibling Day is a relative newcomer. Claudia Evart, a freelance paralegal from Manhattan, New York, got things started. After losing both her sister and brother at an early age, she took on the mission of establishing a recognized day to honor the sibling relationship. April 10, the birthday of the sister Claudia lost, has been designated as National Sibling Day. 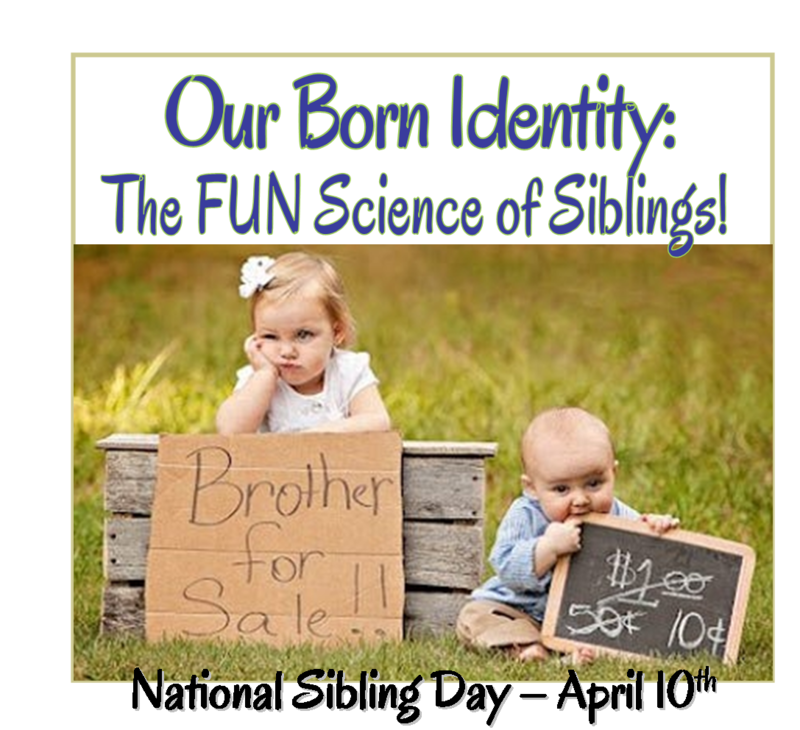 While it hasn’t been federalized yet, it is recognized as a state holiday in 39 states and the organization Claudia founded, the Siblings Day Foundation, is working to expand that number. 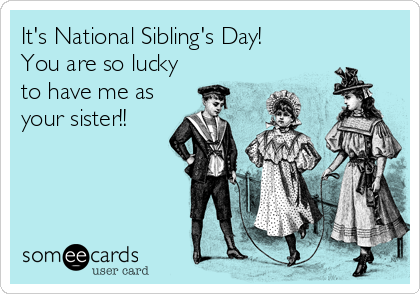 To celebrate National Sibling Day, we can phone, text, email, or visit that special sibling. 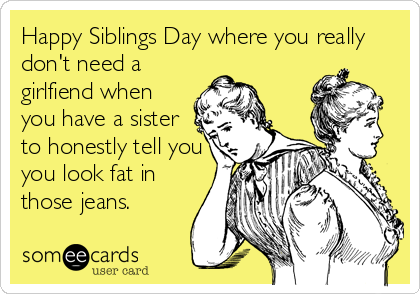 As a matter of fact, the Siblings Day Foundation would be happy to send a sibling e-card for you! If you have lost a loved sibling, you might celebrate with contacting another who loved them and sharing a memory or honor them with an act of kindness done in their name. Well, I’m off – I have a few phone calls to make!